Do you have a blocked sewer or toilet and require sewer cleaning? Are your storm water drains blocked? 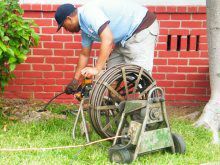 Does your sewer or storm water drainage system need repairs? Look no further! Fraser’s plumbing and drainage specialists has been offering these services for 35 years, and drainage maintenance and treatment of existing underground sewer and storm water drainage systems is our area of expertise. We use the most up-to-date technologies to clear and clean culverts, pipes, drains and sewers. Our availability and level of service is a point of difference in the plumbing industry.